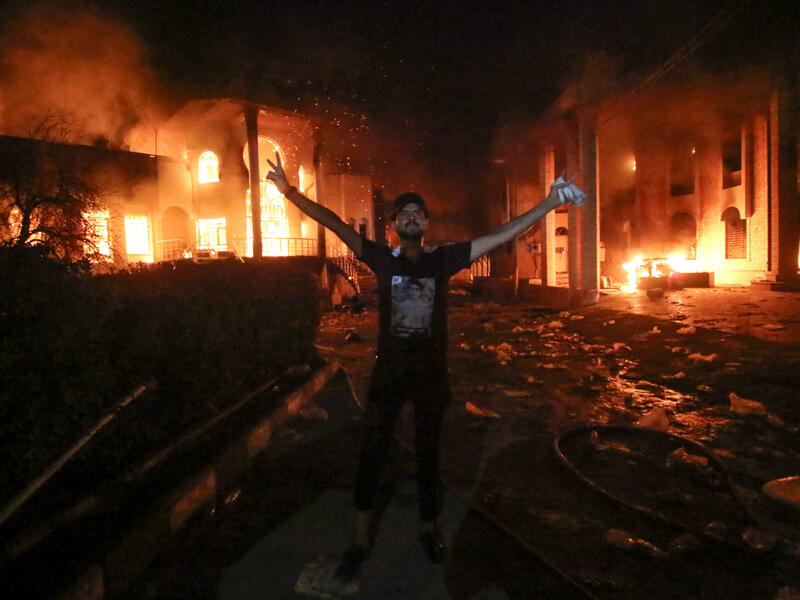 Iraqi protesters gathered outside the burned local government headquarters on Friday. The protesters have called for an end to Iran's influence and to the Iraqi government's dysfunction. They demanded jobs and basic public services. Thousands of residents, living in poverty in the oil-rich region, have grown ill from contaminated water, according to health officials, and the electricity has cut out amid temperatures in excess of 100 degrees Fahrenheit. Outraged demonstrators, shouting "Iran out," torched the Iranian consulate after security forces withdrew, as NPR's Jane Arraf reported. Hours later, airport officials said assailants fired three rockets at Basra's international airport, which is adjacent to the U.S. Consulate. No casualties were reported. It is unclear who launched the attack. Earlier in the week, protesters burned the offices of a major Iran-linked militia, Asaib Ahl al-Haq, and an Iran-backed political party. They also set fire to the city's provincial government headquarters, blocked the entrance to the country's main port of Umm Qasr and set up roadblocks on the highway from Basra to Baghdad, port officials said. Other civilians held two Iraqi workers hostage at an oilfield outside of the city, Reuters reported. "On paper, Basra is one of the richest cities in the world in relation to the production of oil," Lukman Faily, a former Iraqi Ambassador to the U.S., told NPR. "In reality, people don't see the wealth. They see their integrity in question as a result of government inability to provide basic functions." The problem is corruption, incompetence and lack of political will, he says. "It's a structure and culture of failure. Add them up together and you get what you have now." He went on to say, "The key question is, will the protests stay in Basra or spread elsewhere?" In the midst of the chaos, medical officials and activists say at least 10 protesters died when security forces allegedly opened fire to disperse the crowds. Prime Minister Haider al-Abadi said he instructed security forces not to use live ammunition and flew to Basra earlier this week, ordering an investigation into the protests. Iraq's foreign ministry expressed "deep regret" over the attack on the consulate and called on local authorities to protect diplomatic missions. Iran's Ministry of Foreign Affairs blamed the Iraqi government, calling it "responsible for security oversight leading to attack on its consulate," according to the Iranian government's Press TV. It added that "Iran calls for maximum penalty for rioters." Shiite cleric Muqtada al-Sadr, who celebrated an electoral victory in May, had his own message for Abadi, according to CNN: "I hope you don't think that the Basra revolutionaries are just a bubble ... quickly release Basra's money and give it to clean hands to start at once with immediate and future development projects." The U.S. Consulate General in Basra‎ conveyed its "deep concern about the violence" in a Facebook message posted before the rockets fired. It called on the Iraqi government to investigate allegations of excessive force and said it would "continue to support the Iraqi people and their government in their efforts to reform the economy, fight corruption, create jobs, and provide the services that the Iraqi people deserve." Years of corruption and militia control have crumbled the city's infrastructure, and Iraqi politicians have struggled to form a coalition government since parliamentary elections in May. The government sent security forces from Baghdad to parts of Basra, Ambassador Faily said. Officials also announced a curfew to calm the city. Iraq's Minister of Water Resources traveled to Basra on Thursday and trucks containing water were sent to the province, according to official media. The interim head of parliament planned to convene an emergency meeting on Saturday, Reuters reported. 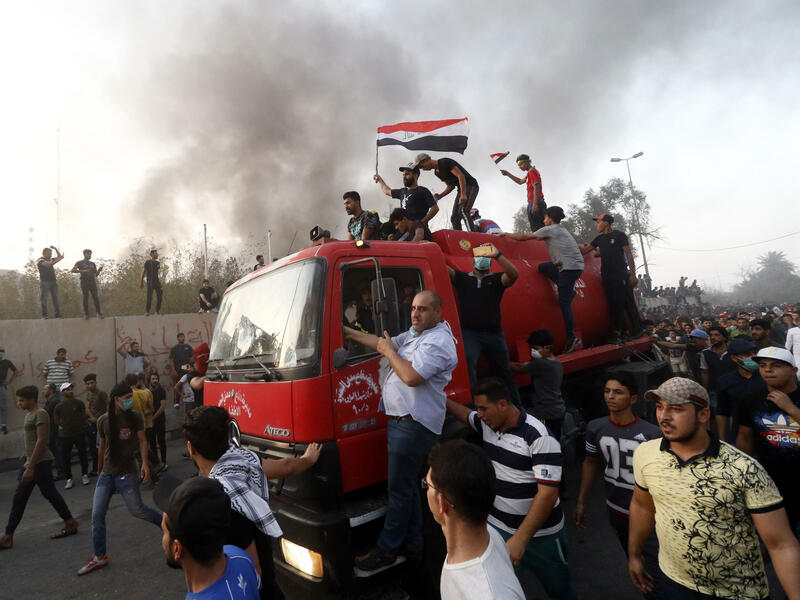 The unrest in Basra started in July and comes as the Trump administration seeks to exert pressure in Iran by stemming its oil revenues and reimposing sanctions.